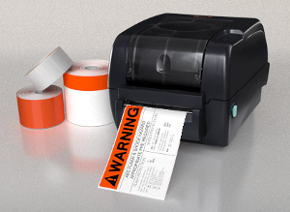 The SafetyPro is the #1 leading arc flash vinyl label printer in the industry. Chosen around the globe for its superior quality, speed and durability, it is easy to see why the SafetyPro is #1. Only the SafetyPro offers you full-resin thermal print on a multi-layer, scratch resistant, chemical and UV resistant substrate. If you need labels that will last, even in harsh conditions, you need a SafetyPro. We now have more arc flash supplies to choose from than ever. Whether you need orange, yellow, red or green stripe arc flash labels, we've got 'em. Our arc flash labels are 4mil thick with a tapered edge for maximum durability and edge-impact resistance. 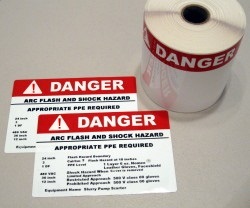 Print your custom arc flash labels and apply them, and you won't have to worry about them for years to come. Try getting that promise anywhere else! As you shop around for the best arc flash labels, make sure you request samples. When you compare our arc flash labels to the major competitors in the market, you will see and feel the difference. While some companies offer you paper-thin, easily torn arc flash labels, we offer you 4mil thick, poly-overlaminated vinyl labels, with superior print and durability. Once you get their samples and ours, give us a call to learn more about the benefits of longer-lasting, more durable arc flash labels. We'll be happy to answer all of your arc flash labeling questions.